In response to the announcement by the police that they have placed Goliath Tabuni on the WANTED list, Goliath Tabuni told Bintang Papua last Saturday that he had laughed at the announcement, and said it was very strange bearing in mind that he has been waging a struggle already for several decades, so how come he has only now been put on the WANTED list. 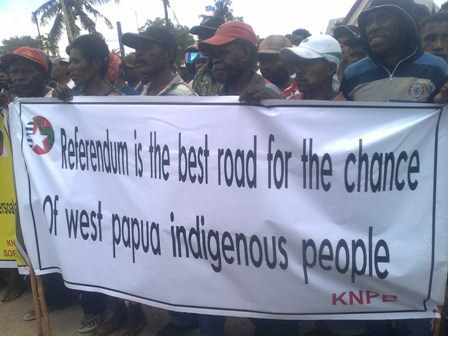 ‘There must be tripartite talks between the United Nations, the Indonesian Government and representatives of the Papuan people who shall be determined by the TPN/OPM,” he said. He finally declared that the TPN/OPM will continue with its struggle and can never be intimidated by acts of terror and intimidation by the Indonesian security forces which are carried out by the chief of police and the commander of the Cenderawasih/ VII Military Command. 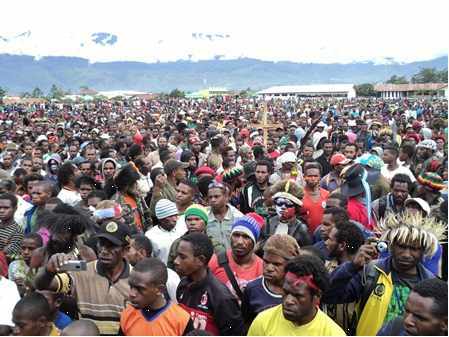 JUBI, 23 March 2012The commander of the district military command in Jayapura denied that any military operations are taking place in Papua. Lieut-Colonel Rano Tilaar was speaking to journalists after taking part in a Joint Forum of the SKPD (?) and the start of a Consultation on Development in Jayapura. ‘There are no military operations under way in Papua, but only Security Operations Along the Border. We have to realise that although the situation in general is calm and orderly, there are conflicts going on, vertical conflicts as well as a horizontal conflicts,’ he said. The vertical conflict is related to various problems between the government and those wanting independence – or separatism – while horizontal conflicts are those that occur between groups within the community where there are differences between the native population and the newcomers. According to Rano, in the present political situation in Papua, the TNI – Indonesian Army – regards the group which pursues the ideology of M – merdeka – as our brothers. 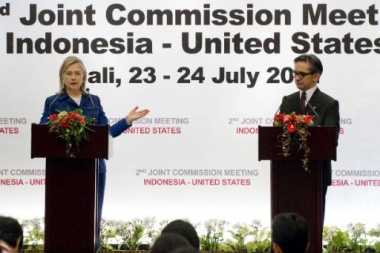 The difference between us, he said, is they have not yet accepted the ideology of NKRI – the Unitary State of the Republic of Indonesia. When asked his opinion about the the Third Papuan Peace Congress [held last October], he said that this meeting was not representative of the Papuan people because according to information he has received from local customary leaders and religious leaders, there was no legitimacy for the creation of a state and the appointment of the president and the prime minister of that state, because others felt that they had not been consulted and they were not willing to legitimise the congress as being representative of the Papuan people. 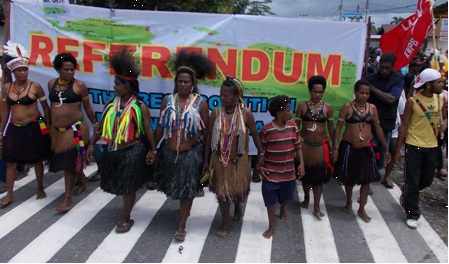 Jayapura: With the help of an NGO in the USA and the European Union, ELSHAM-Papua has drawn up a comprehensive report of cases of human rights violations that have occurred in West Papua during the period since it became part of the Republic of Indonesia. ELSHAM co-ordinator in Papua, Ferdinand Marisan S.Sos told Bintang Papua that they had already completed their collection of data. 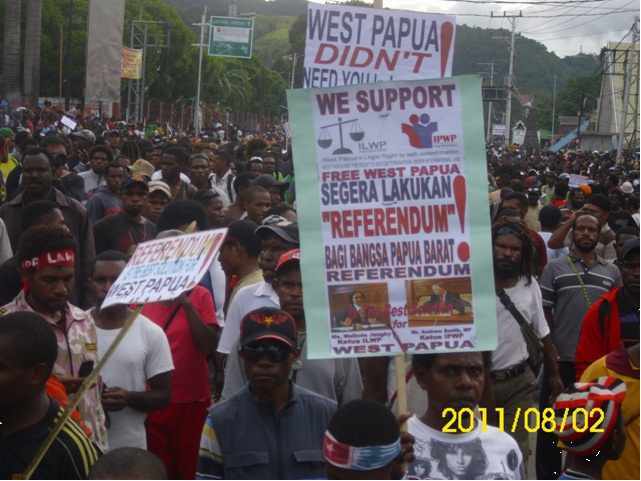 ‘We have collected data about human rights violations in Papua from the year 1969 up to 2010,’ he said. He said that they had been doing the work since February this year and had completed it in April. He said that the compilation had been done together with the ICTJ, the International Center of Transitional Justice, a body that has the support of the European Union.